Today, we get the third and what is presumably the final trailer for Alita: Battle Angel. The sci-fi epic was supposed to hit theaters this Christmas, but Fox keeps kicking it around the release schedule. We'll now have to wait until Valentine's Day, February 14, to see Alita in action. This latest trailer shows off the finished VFX in director Robert Rodriguez's epic. And it looks astonishing. The movie was supposed to be directed by James Cameron years ago, but the wait has only helped bring this Manga adaptation to the big screen. James Cameron is still on board as a producer, but handed the reins over to Rodriguez so that he could focus on directing four Avatar sequels back to back. Fox delivered this message with the latest trailer this morning. "An angel falls, a warrior rises. Watch the all new trailer for #Alita: Battle Angel now, and see the movie in theaters on February 14. From visionary filmmakers James Cameron and Robert Rodriguez, the film stars Rosa Salazar, Christoph Waltz, Jennifer Connelly, Mahershala Ali, Ed Skrein, Jackie Earle Haley and Keean Johnson." Alita: Battle Angel is an epic adventure of hope and empowerment. When Alita (Rosa Salazar) awakens with no memory of who she is in a future world she does not recognize, she is taken in by Ido (Christoph Waltz), a compassionate doctor who realizes that somewhere in this abandoned cyborg shell is the heart and soul of a young woman with an extraordinary past. As Alita learns to navigate her new life and the treacherous streets of Iron City, Ido tries to shield her from her mysterious history while her street-smart new friend Hugo (Keean Johnson) offers instead to help trigger her memories. 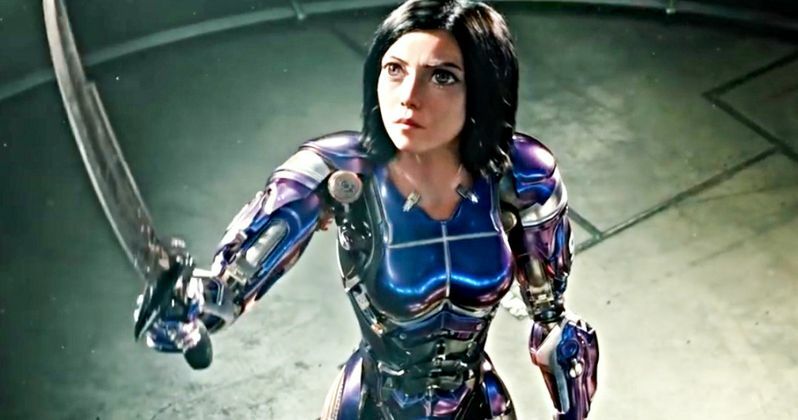 But it is only when the deadly and corrupt forces that run the city come after Alita that she discovers a clue to her past - she has unique fighting abilities that those in power will stop at nothing to control. If she can stay out of their grasp, she could be the key to saving her friends, her family and the world she's grown to love. This latest trailer not only offers up some truly breathtaking action sequences, it also gives fans a first look at the deadly sport of Motorball. Motorball is a hyper-violent gladiatorial contest that played a big part in the manga upon which this action-packed sci-fi thriller is based. Alita: Battle Angel has been a longtime coming to the big screen. It definitely looks much different than it would have had James Cameron directed it over a decade ago like planned. Perhaps the long wait is only a benefit to what we'll eventually see on screen. Having two maverick filmmakers bringing it to life in Robert Rodriguez and James Cameron surely isn't going to hurt things either. Will Alita Soar High or Crash Hard at the Weekend Box Office?